While Nintendo's making sure to have at least one big first-party title available for the launch of their new console in the form of New Super Mario Bros U, some of the company's other heavy hitters are quite as lucky. Metroid Blast—part of the themed mini-game collection Nintendo Land—isn't quite a full Samus Aran adventure but it brings in elements that hark back to the Metroid experience. And Nintendo's just revealed the other franchises getting similar treatment in their console's virtual amusement park. • Yoshi's Fruit Cart: Using the GamePad touch screen and stylus, the player draws a path for the Yoshi Cart to follow through each course. However, only the view of the course displayed on the TV screen shows fruit that must be collected and obstacles that must be avoided along the way to the goal. This fun attraction is a great example of the kind of integrated second-screen game play made possible by Wii U and the GamePad controller. • Captain Falcon's Twister Race: In this single-player Attraction based on the F-Zero racing franchise, players get a top-down view of the track on the GamePad, which is held vertically and turned to steer the vehicle through a winding, twisting track, as they try to hit checkpoints before time runs out. Driving across dash plates can provide a quick burst of speed, while obstacles like speed spikes, whirlwinds, other vehicles and even bombs can make for a dangerous run. • Octopus Dance: In this single-player Attraction, players use the GamePad to mirror dance moves performed by a deep-sea dance instructor. The goal is to always be watching one's own movements from the back to more easily mirror dance moves, but the dynamic interaction between the GamePad and the TV adds a unique twist. Players must be ready to switch between the views offered on the TV screen and the GamePad screen, as sometimes one view is more useful than the other. 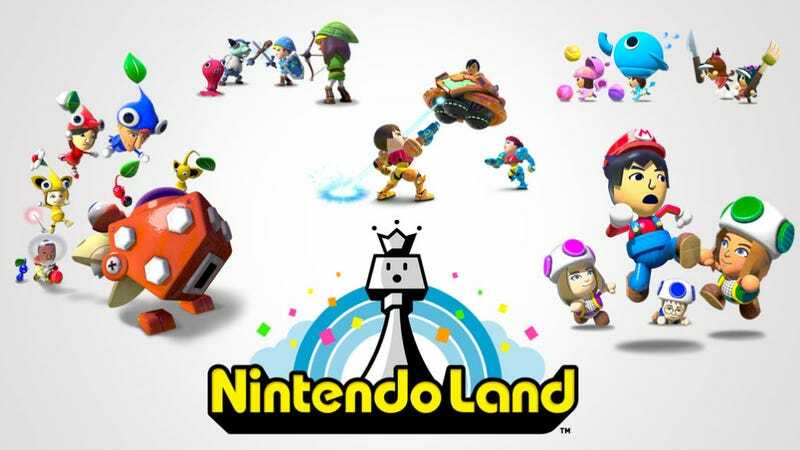 So, the Yoshi and Falcon fans amongst you should again note that Nintendo Land comes out on November 18th, either bundled with the $349.99 Wii U Deluxe Set or comes sold separately for a $59.99 price tag.